PRODUCTS THAT SAVE MY TIRED FACE. You know those people who complain about having dark under-eye circles but in reality you can never see them? Yeah, thats not me. Mine aren’t the fading type. There more like the ‘are you sure you’re not ill?’ kind of guys. With that being said, I feel like I’ve got my products that help make myself look a bit more alive down, and theres some new stuff I’ve been using too! I was recently sent these under eye patches from Anatomicals and with it being my first time trying the brand, didn’t know how I would go. However, I’m super pleased to report that they are amazing. So hydrating, not at all harsh on my sensitive skin, and makes your under eye area look 10x better than it did before. I’m definitely going to make an order when I run out. Plus, I love their branding! I’ve run out now which makes me a bit sad, so I need to get some more! I haven’t had a fancy eye cream for so long now, and I really wanted to treat myself (and my peepers) to one. I picked up the Origins Ginzing eye cream after reading rave reviews, and I was not disappointed. I’ve been using it twice daily and really noticed a difference since one of the first uses. I’m going to keep trialling it over the next few weeks, so stay tuned to my social media because I’ll be raving about it if the results keep up! Concealer is key for covering up my dark circles and making me feel prettier with them faded a little. 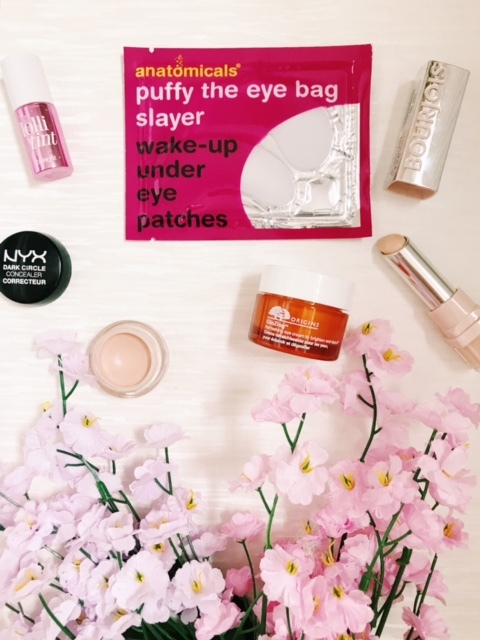 I love the Bourjois Blur The Lines Concealer which is great and not drying, and then I go in with the NYX under eye corrector which is a gorgeous peachy tone that really does the job when it comes to covering the dark up. I’ve always loved blusher as I’ve found it always makes my skin look healthier and myself look a bit more alive. For months now I’ve been using the Benefit Lolli-tint which leaves my cheeks with a lovely healthy flush. I really love this stuff! Plus the fact that it’s so easy to use is great for clumsy people like moi! I so want to try the NYX under eye corrector! I forgot to pick it up whilst in the UK and now I’m not sure I’ll get a hold of it in France… These patches look amazing though! Me every single day to be honest haha! I’m perpetually tired so I’m always looking for products that keeps me looking fresh. I need those under eye patches! They are so lovely to use! Ugh that eye cream! I need to get my hands on it! It sounds amazing. Those eye patches sound perfect, exactly what I need in my life. Also love the look of Lolli-tint!